Fr. Dominic has been using a brotpisker or Danish dough whisk for decades and says he wouldn’t want to be without it. This useful tool quickly mixes batter for muffins, pancakes, cornbread, or any quick bread, without overbeating. Your breads will be light and airy, without that dense, tough texture that results from over-mixed batter. Stainless steel with a beech wood handle. 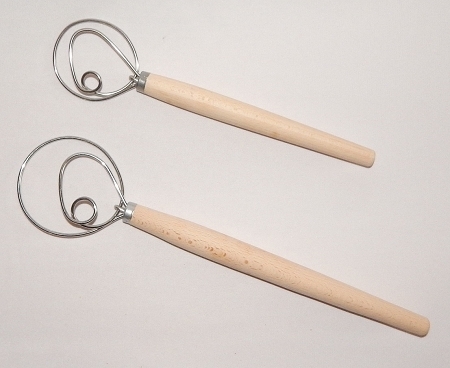 The whisk comes in two sizes: 15 inch and 12 inch. Made in Poland. I ordered this dough whisk probably 20 years ago. Best thing i ever did. I have used it so much i wore the imprinted label off. I teach community based cooking classes and every student wanted my whisk. I hope I sold a few for this wonderful program. It has weathered well and I still use it to make bread. It is wonderful. If you make any kind of bread I would strongly suggest you get yourself one of these.